I have to say, when I saw that dress in Burda, I was not a fan, but your version changed my mind totally. It's gorgeous! Love the fabric choice, the fit, and both ways you styled it! I *love* it with the evening styling!!! Sensational. Love your styling photos too. Both the day and night shot look fabulous. Total knockout. Another of your Burda makes that is sending me to hunt down that issue. Not to be a total cloner, but I have a ton of mint-green linen that I'd love to find a project for. Well done! The dress looks way better on you than in the model picture or the line drawing! I didn't even recognise this dress as being in the January Burda! It looks fantastic on you and love how you have styled it for day and night. Such a pretty, versatile dress. And I love your daytime shoes! A crossover bodice that doesn't gape is kind of like the holy grail to me so I am really glad to see this pattern made up. The Burda line drawing looks very low cut and the fabrics in the photo are a bit offputting so to see it in plain white linen is great. I really like the dress on you, the day look with the tan accessories is particularly fab! Thank-you for making this dress as I really liked the pattern but thought the bodice wouldn't work for me because of my small bust issues. So now that you have done all the hard work, I will add it to my list. This dress really suits you and as usual, you have sewn it beautifully. Nice frock! Both ways of styling look good. Very pretty summer dress. Love the cross over style and it fits very well. OMG, I am so going to make this dress. I did not rate the shocking pink horror in the magazine much, but if you are telling me it has a non-gape neckline for those of us small of bust i'm definitely in. I love it on you in white, especiall with this extra stylish hat, and I feel greatly encouraged to try more white too. I always thougth I was too pale, but you are living proof that white clothes and pale skin go together well. A fabulous dress in every way Kristy, looks great! That dress is so cute. Well done! That looks so summery & cool! Linen is my favorite fabric. Of course, I'm freezing my duff off here in the States, but that dress makes me long for a hot summer day. I like your dress SO MUCH MORE than Burda's! 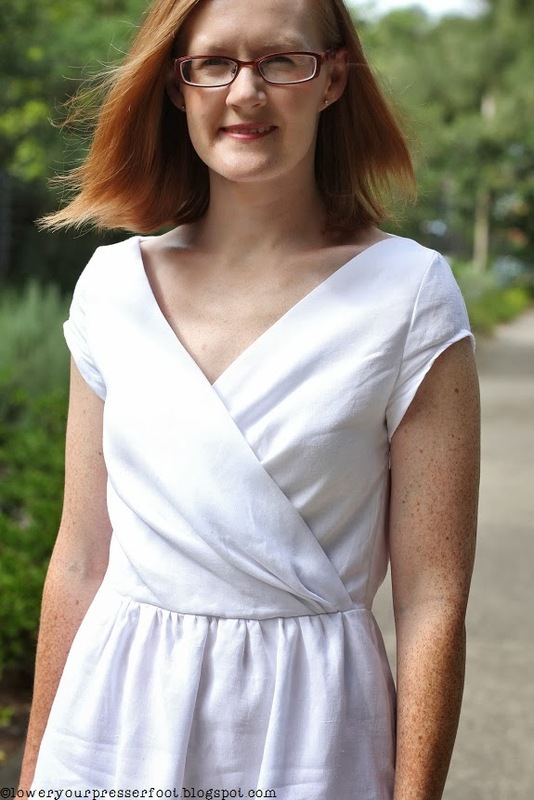 Love the white and the neckline. My goodness, I love this dress! The style and fabric go perfectly together. You did a great job styling for day and night too. I agree with Joy... 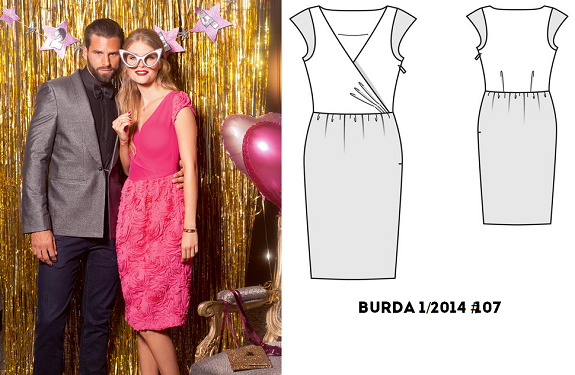 I hadn't been impressed by the Burda magazine, but your version is quite cute! Such a pretty dress! Just love the complete ensemble with the hat and bag! absloutely stunning! Love the dresss, much better than the original! I think the fabric Burda chose for the dress skirt was too thick and too heavy. Yours is just perfect! And you look really great in white! You look fabulous in white and I love how you have accessorised this classy dress. A very lovely summer dress indeed - so versatile. Linen is just so gorgeous for summer. It really has been made very nicely. Good luck with the contest. Linen is so cool and comfortable. I also think dressing up white for evening is a challenge and you more than met that challenge. Love this dress. It looks stunning on you! Love this dress! And I'm so glad you made it. The line drawing got me all excited but the model photo is AWFUL so I completely dismissed the pattern. That textured skirt fabric is the worst for a gathered skirt, but it also looks slouchy and baggy on her. You are a brave soul to go forth with this pattern with that as inspiration, and it worked out so lovely. 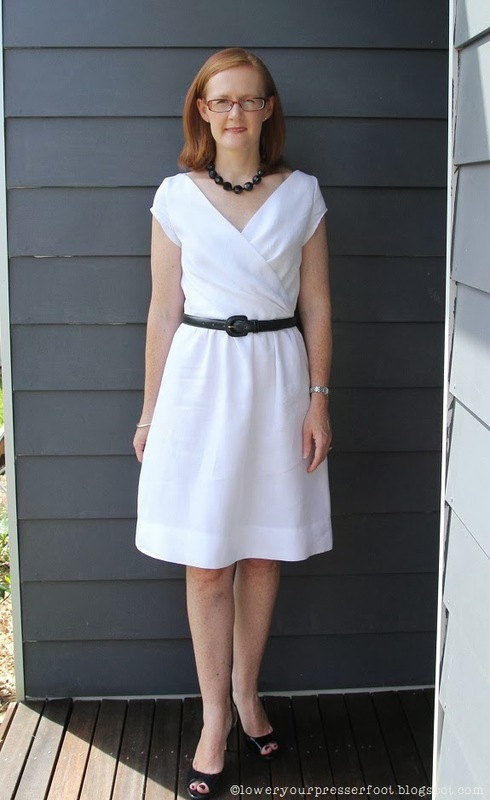 Perfect classic summer dress! Your sewing year is off to a great start. 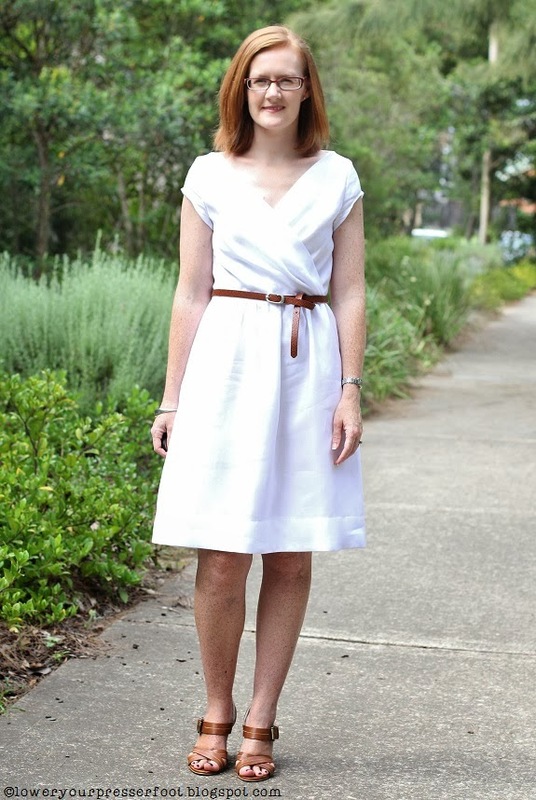 I'm a sucker for white with tan accessories - love it with the brown sandals and belt. Gorgeous dress! I am, however, wondering how you get your hands on the Burda magazines so quickly...The last edition my local supplier (Magnation Melbourne) received is November 2013! Is there anywhere you can recommend? It's stunning!! I love it! So much better than original (which doesn't atttract me at all). Wonderful job!! !